In the main character in the story is Four-Girl who lives with her cousins, aunts, mom and grandfather who hates her. Four-Girl tries embracing her ''devil'' side and begins making a devil face. Her mother takes her to a acupuncturist, Dr.Won who she befriends. Four-Girl begins seeing a real devil (christian). When she tells, Dr.Won who is teaching he about Jesus Chris takes her to see the priest, Father Bey. Father Bey then invites her to join the church and she receives a new name: Vibiana. Vibiana's mother and Uncle Jong finds out and she is slapped multiple times. Her mother tells her she does not want them to be involved with the foreign devils religion because it will poison their mind and will destroy their spirit. She runs away from home and goes with Father Bey to a bigger village with a big church in the center. She is living and working in an orphanage at age 14 under the supervision of a woman named Maria. She meets a seminarian name Kong,who face looked like it'd been chewed by a wild animal. He tells he used to belong to a gang of bandits until a robbery went wrong and he killed the local headman's brother so they spent several months hiding. Finally, a man named Yu, who was with Father Bey asked them to be their bodyguards. Eventually, Yu and Father Bey have a falling out and when Yu and the others leave Kong stays behind. Yu was not happy about that so he cut his the lines on his face to look like rat whiskers. Kong stays with Father Bey. One day, women and children devils come to the village for protection from "a the Society of the Righteous and Harmonious Fist". Kong begins to train Vibiana to so she can be a maiden warrior just like Joan and so she can protect her village. One day while training, she hears voices and she sees Dr.Won and Mrs.Won. Father Bey tells her that Dr.Won is a opium addict and his wife is his accomplice. 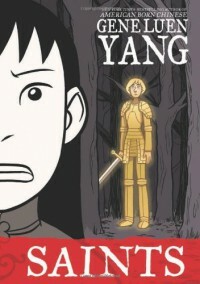 While she is in the woods, she sees her cousin Chung and finds out he is apart of the Society. The next day, the Society attacks the village so Vibiana takes the orphans to the church and then goes to find Dr. Won. She sees him smoking and runs away only to be captured by the Society. Later, she finds out Kong was killed by getting shot in the head with an arrow. Some of the Society members go to the church and tries to shoot at Father Bey but Dr.Won steps in front of him and is hit. Unfortunately, he shoots the arrow again and Father Bey is hit. The leader of the Society shows up after Vibiana is captured and tells her if she renounces her foreign faith he will let her go if she does not he will kill her. She sees Joan one last time and she is burning on a pole. Vibiana teaches him a prayer of the Christians. She doesn't want to renounce so he just asks her for her name but she says Vibiana. So he asks for her Chinese name and she repeats Vibiana and she is then killed. The connection to the text and myself is that I am half Christian but also half Catholic but I don't have to be afraid of what religion I am. Also, I will not be murdered because of what I am or who I worship. The connection to the text to the text is that there is another side of the story with the Society members. The connection for text to world is people should not be killed because of who they are or what the look like. I would recommend this book to others because it's very interesting and it is a historical fiction. I think they should also read the book boxers which is about the leader of the Society side of the story. I think people who like history stories would enjoy this book.